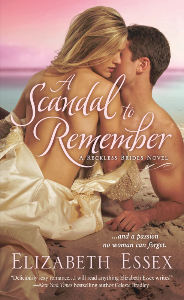 EE Newsletter-ALMOST A SCANDAL on sale now! AFTER THE SCANDAL is on sale tomorrow! Timothy Evans, the Duke of Fenmore, has palmed more treasures than he can count. Even for a man who grew up thieving in Londonâ€™s stews, a stolen bride should be beyond the pale. But Fenmore wonâ€™t let scandal ruin the spirited beautyâ€™s reputation. And now that sheâ€™s stolen his heart, how can he ever let her goâ€¦? Please feel free to share this newsletter with anyone you think might like to read it. Enter the Book Giveaway Hosted by St Martin's Press. Copyright Â© 2014 List Maintained by Bemis Promotions, All rights reserved.